The hospital caters to the poor and needy through its charitable wing of NU Trust. NU Trust is actively involved in several community outreach activities on an ongoing basis such as the organizing of free health camps, convening of seminars on the prevention of nephrology-urology disorders and giving back to the industry and society by providing the best of its knowledge and service resources. To the thousands of less privileged patients diagnosed with renal disease, long-term care involves enormous expense, especially for haemodialysis as well as transplant and its post-operative care. With assistance from the government, and private sponsors, needy patients are provided treatment either at subsidised cost or even totally free, with funds collected from donors. 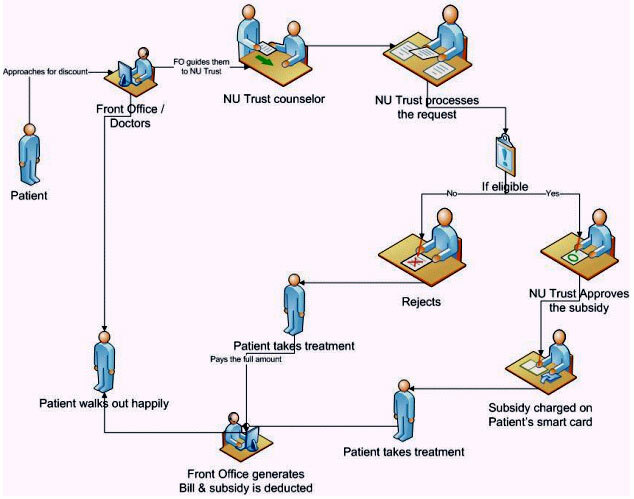 The main criterion to be eligible for subsidised care at NU Trust is economic need, determined both by the doctors as well as the medico-social workers at the hospital. 2) Address of the Hospital: C.A.6, 15TH MAIN, 11TH CROSS, PADMANABHANAGAR, BANGALORE-560070.